Dominic's Journey, Mom's Journal: Tractor !!! 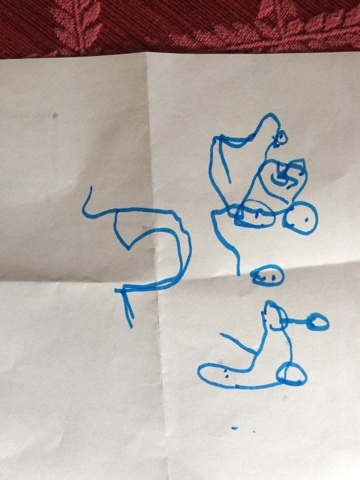 One of the developmental stages we entirely missed is that one where kids draw. You know - little popsicle trees and stick figures? And outdoor scenes. Dominic regressed right around the time he should have started drawing things and we never got him interested in it. Today, he worked with his OT intern friend again. And they were working on pincer grip (new goal, being able to trim is OWN fingernails - he's got the desire but not the strength). Dominic stopped, and tried writing something with his finger on the table. The OT got him a piece of paper and asked what he wanted. 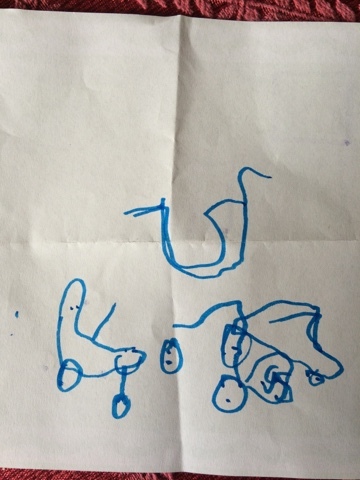 Dominic said "Tractor"
I give you the tractor he then drew, with no assistance AT ALL.